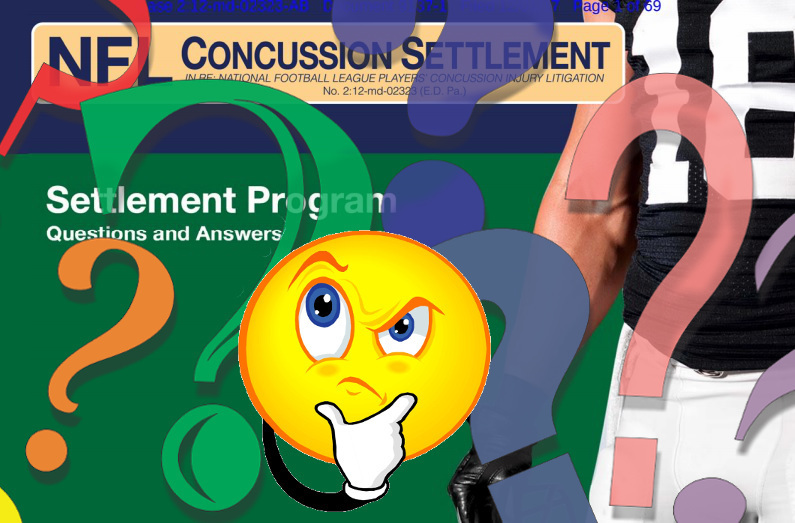 On December 1, a proposed document of Frequently Asked Questions (FAQ) was posted via Electronic Court Filing (ECF) to the NFL Concussion Settlement docket. The purpose of the FAQ document is to aid the neurologically impaired football players who are class members to the settlement in understanding its terms and filing their claims. During the enrollment period for the settlement, when retired NFL players had to make a choice between enrollment in the settlement, opting out, or ignoring it all together, in order to encourage enrollment Co-Lead Class Counsel Christopher Seeger, along with Claims Administrator Brown Greer portrayed the enrollment and claims processes as “simple.” They encouraged retirees to not hire independent counsel for this reason. They were told if they had a qualifying diagnosis their claims would be approved, and a 30-60 day window was referenced as an estimated approval time. As a result, approximately 20,000 retired players or their representatives registered for the program, including many who had previously objected or opted out. As I’ve reported in numerous articles, the settlement has been anything but simple. Of over 1,900 claims submitted, 191, or a mere 10% have been approved in the first ten months of claims processing, with the vast majority of claims kicked back as deficient in some way. The 69-page FAQ document is presented as an aid in helping players to navigate the in-and-outs of the settlement features and claims process. But before even the first FAQ is examined, a large question looms. . . How is a brain damaged person supposed to comprehend a complex 69-page document? Since according to a claims report released in December, 43% of class members who have filed claims thus far have not retained an attorney, a large number of impaired persons will be trying to work through this process alone. Even one suicide has been reported as occurring while the retired player had claims paperwork on the table. Apparently he found the process too daunting to continue, or even to continue on with his life. Until and unless the settlement is administrated in accordance with its written terms, and as portrayed to the retired players and their families, this is what they have. This article delves into some of the answers which prompt additional questions. FAQ 1 is a pretty accurate description of the settlement. So far so good. The first benefit described is the Baseline Assessment Program. One important aspect of the Baseline Assessment Program (BAP) is that unlike the Monetary Awards Fund (MAF) which is uncapped, $75 million has been allocated to this program. If the funds should be exhausted, will players be denied access to the program strictly on those grounds? The above statement is technically true – however – the omissions from the statement are likely more relevant than its assertions. While claims are not determined by the NFL, but rather the Claims Administrator and/or a physician selected for the appeals panel, the NFL was granted the right to appeal an unlimited number of claims for any reason, and unlike class members who must pay $1,000 to appeal a claim, the NFL has no financial liability in this respect. Also omitted was how much input the NFL may have had in designing the processes and protocols on which determination is based. While it’s certainly reasonable and necessary for class members to know who the administrators are and what their duties comprise, it would be beneficial for them to know something about these administrators. What was the procedure the Court used in selecting these parties? Has either of these administrators previously worked with the NFL or Lead Class Counsel in other litigation? Has the Lien Administrator ever worked for any of the insurers that he might be asked to negotiate with in regard to players’ medical liens? Who are the governmental agencies with whom the lien administrator has negotiated? What kinds of discounts and/or caps has he procured for the Class? Based on their qualifications and performance thus far, the Special Masters appear to be doing the job to which they were appointed in a neutral and reasoned manner, but like any other parties to the Settlement who serve by appointment, the selection process should be transparent. Are they, or have they ever been affiliated with any other parties in the settlement? Perhaps the reason for a 69-page set of FAQs is best summarized by the statement above from Mr. Brown. He states that he is implementing the settlement in accordance with the intentions of Mr. Seeger and NFL Counsel. Since Class Members and likely their attorneys (based on some declarations from other counsel who were part of Executive or Steering Committees) have not been privy to such information. A contract was written and signed by these parties. Like any other contract it should be implemented in accordance with its written terms, not the intentions later inferred by the parties. If the Claims Administrator is truly a neutral party established to implement the terms of the Settlement, then he should be permitted to do so in accordance with its written language, answering only to the Court and Special Masters. FAQ 8 deals with Settlement opt-outs. FAQ 10 (not pictured) deals with requirements for opt-out plaintiffs to opt back into the Settlement. What isn’t addressed is if there is a procedure to opt-out for Class Members who took Chris Seeger at his word in regard to how the Settlement would be implemented versus how it is unfolding? I believe the answer to this question is “No,” but perhaps this is something that should be considered or at least addressed. If a neurologically impaired retiree has the presence of mind to click on the first link and scroll through the list of documents on the second page, he will eventually find what he’s looking for at number 18. When he clicks on this link he will find a copy of the 161 page Settlement Agreement written in the language of legalese. Most non-attorneys are not equipped to navigate this document, much less pro se class members who enrolled for the Settlement because they are neurologically impaired. Is this the intent of the Parties? Does the NFL hope to mitigate its losses due to impaired retirees’ inability to navigate the documentation? Is this why retention of independent counsel was discouraged? If by chance a self-represented player or his representative was able to navigate and understand all of the intricacies of the agreement how are they to navigate the unwritten implementation changes made in accordance with the intentions of the parties? Class Members are instructed to NOT contact the court with questions, but instead are referred to enough documents to fill the covers of a novel. Are the brain damaged players expressly forbidden to contact the Court at all? If they are not supposed to retain Counsel, who is responsible for sorting through the mounds of documentation and explaining it to the brain-damaged Class? Surely not Mr. Seeger; the Class has already been immensely confused from his explanations. While he seems to take issue with claims settlement funders misleading and taking advantage of brain-damaged players, has he not done the same? Since eligibility is not parallel with CBA negotiated benefits, eligible seasons should be explained. How does time on injured reserve affect eligible seasons in respect to the Settlement? Many vested retirees have been surprised to learn that time on IR, while not affecting eligibility for retirement benefits and disability plans has disqualified them from Settlement awards. Perhaps this is outside the scope of Settlement FAQs but it’s a question worth asking, “Why have nearly all 88 Plan applications been denied since the Settlement Claims process began?” In an email between a Class Member and Scott George of Seeger Weiss, that was shared with me, Mr. George wrote, “We expect in most instances that a player with a Plan 88 diagnosis will also qualify for a monetary award dated at or near the time he first became eligible for Plan 88 benefits. However, the evaluation used in the Plan 88 Program does vary from the Qualifying Diagnoses in the Settlement Agreement.” This has not seemed to be the case as many 88 Plan beneficiaries have not been able to overcome the apparent language discrepancies between 88 Plan and Settlement requirements. Perhaps the 88 Plan has begun denying applicants based on Settlement specs? No one seems to know why this is occurring but someone needs to come forward with the answer as to why qualified 88 Plan recipients are being delayed or denied in the Settlement and why the 88 Plan appears to be no longer approving applications. How may the retired players become involved with the educational program? Will they have a voice in how the programs are administrated and disbursed since it is, after all, their settlement? In regard to youth football programs and education will the NFL be allowed to direct the narrative as it has done for decades? NFL misrepresentation, concealment, and deceptive research necessitated this settlement. It would be the cruelest of ironies if the litigation brought because of these deeds actually worked to perpetuate them. 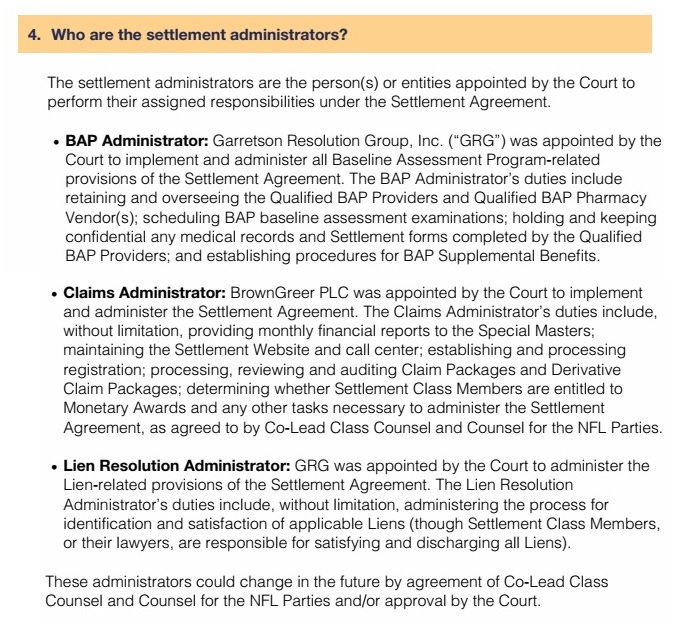 FAQs numbered 1 – 23 deal with general Settlement questions. The FAQs in this range that I’ve not highlighted seem pretty straightforward, although a reference in No. 18 mentioned “30 days” and did not specify whether this refers to calendar or business days. Since the general FAQs raise substantial questions, I’ve saved the BAP and Monetary Awards FAQs for a future installment. Judge Brody issued a notice permitting attorneys and Class Members to address the FAQs as presented in the proposed document through December 15. I have spoken with a number of attorneys who have presented questions and asked for greater clarification on the FAQs. It is hoped that through this dialog, at least some of the problems plaguing the settlement will be remedied; although, the remedy lies more in fast-tracking claims approval for neurologically impaired, retirees than in providing them with more material to read and paperwork to deal with. 2018 is just around the corner. A new year always brings with it resolutions for improvement and change; here’s hoping one of those resolutions will include a more equitable process to suffering players and their families.